Koi fish are ornamental fish belonging to the carp family. They are descended from wild carp but have been selectively bred for centuries, mostly in Japan, for their striking and beautiful scale colors. Size: When properly fed and housed in well-kept koi ponds, these fish will grow rapidly, reaching an average length of 24 to 36 inches. Color: Cream, red, yellow, white, blue and black are the most common koi colors. Koromo. These koi fish feature blue-tinged scales that shimmer under light. Goshiki. This variant usually has a black body accentuated with blue, red, brown and white color splotches and patterns. Showa sanshoku. This fish has black scales with red-and-white patterning. Taisho sanshoku. The opposite of the showa sanshoku, the taisho variant has white scales with black-and-red patterning. Kohaku. Fairly common, these koi have white scales marked with red patterning. Live koi can be trained to eat right out of a person’s hand. If the same person feeds the fish day in and day out, they will come to recognize that person and gather around in expectation. 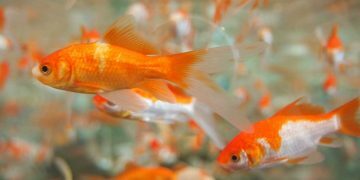 Feeding: Koi food should be varied to include not only formulated fish food, but also items that deliver vital nutrients. Peeled oranges, peas, lettuce, bread and live earthworms are all good choices. During winter, you’ll notice a lot less activity in your koi fish pond, since this species experiences a near halt in its metabolism when the weather turns cold. 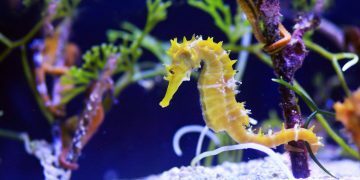 At temperatures below 50 degrees Fahrenheit, their stomachs won’t digest food at all, and anything they eat will rot in their stomachs, causing sickness. During the winter, they will nibble on algae in the koi pond when they need sustenance. Leave them to their own devices until the warmer weather returns. Tank Care: Set up a proper koi pond, including deepened recesses where the fish can hide from any possible predators like birds or animals. A quality pump and a reliable koi pond filter are needed to keep the water clean. Water conditioners that regulate temperature are also very useful; koi thrive in water ranging from about 59 to 77 degrees Fahrenheit. Health Concerns: Spring can be dangerous for koi fish, since their immune systems virtually shut down in the winter and take time to get going again once the weather warms up. Protect koi health by providing clean water and nutritious food during this time, as opportunistic infections and parasites may otherwise wreak havoc on your fish collection. Life Expectancy: Koi fish reach full maturity at 2 years of age, and can survive as long as 30 years when carefully kept. When seeking koi for sale, look for passionate breeders who appreciate the beauty of these fish. In Japan, koi breeding approaches the level of art and is taken very seriously by those who practice it. 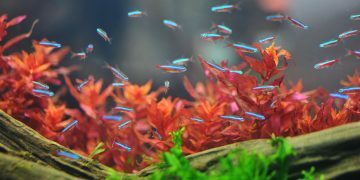 Prices range according to the relative commonness or rarity of the color and scaling patterns, with everyday varieties fetching prices in the $100 to $200 range for a group of 10 fish. Rare and exceptionally beautiful koi command significant premiums on top of this price range.